Finance minister Pravin Gordhan delivered his second budget speech before Parliament on 23 February 2011. 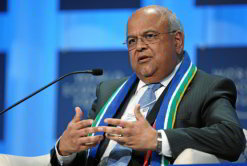 Gordhan focused his upcoming strategy on job creation rather than tight fiscal policies, but this move earned approval from most parties, with the consensus that South Africa, through its years of sound financial management, had earned the latitude to do this. Read the full text of the minister’s speech below, or download it (PDF, 423KB). A short summary is also available (PDF, 43KB). Note: at the time of publishing, the South African rand was trading at 7.13 to the US dollar. It is my privilege to introduce the second budget of President Zuma’s administration. This budget, Mister President, reflects the collective determination of the Government to address with energy the challenges of creating jobs, reducing poverty, building infrastructure and expanding our economy. The budget sets out a financial framework for implementing this vision, a framework that is sound and sustainable. It recognises that building South Africa is a multi-decade project that must invigorate our capacity to grow, and must include all South Africans in that growth. Freedom to work together as communities, as organised social formations, as business enterprises, as a proud and forwardlooking nation. That macroeconomic stability is maintained, with necessary adjustments supporting enterprise and job creation. In tabling another weighty load of documentation today, our aim is to display transparently how South Africans benefit from government’s programmes and policies and how their tax contributions are spent. For the poor, the budget continues to expand spending on housing, rural development, better community services and social assistance grants for the elderly, the disabled and children in need. For workers, the budget emphasises job creation and expenditure on the “social wage,” including access to health services, education, social security, transport and municipal infrastructure. For the business sector, the budget expands investment in modernising our infrastructure and transport logistics, accelerating further education and skills development and supporting research, technology and industrial investment. For the small business sector, there are targeted financial and enterprise development programmes, and tax relief measures. For the youth, there is expanded access and financial assistance for further education, and a range of initiatives aimed at expanding job opportunities. All of this, and more, we must do within a sound fiscal framework. We must also recognise that we are taking steps, this year and next, on a long-term growth path, a decades-long transformation and expansion of our social and economic possibilities. Savings have again been identified in low-priority categories of spending, releasing over R30-billion to frontline service delivery allocations. Support for the Industrial Policy Action Plan is further enhanced. Tax and spending measures are proposed to improve investment and trade performance, enhance science and technology, accelerate job creation, boost small enterprise development and to strengthen rural development and emerging farmer support. Education and skills development are bolstered over the period ahead through expanding further education colleges and student financial assistance, and a new school building programme. Spending on economic and social infrastructure of over R800-billion is projected over the next three years. A new community-based family health-care programme is to be introduced as part of national health insurance, while work is proceeding on the design and consolidation of our social security arrangements. At Parliament’s request, we are tabling guidelines on long-term fiscal sustainability and debt management. Mister Speaker, we live in an extraordinary time in human history – a time of immense transition, of profound risks, but also of great opportunities. We are in the midst of epoch-changing shifts in the global economy as large fast-growing countries, particularly China and India, have become major world producers and consumers. Their weight in world trade, finance and investment and in restructuring the world’s industries affects every country, every firm and every family. Fast-growing economies that are raising living standards and creating jobs have one thing in common. They are continually moving into new products and improving the ways of producing the things they sell. Adaptation to the disciplines and the productive possibilities of the new global economy opens up new vistas of opportunity for improving living standards and expanding employment. But it also presents great challenges. We shoulder the responsibility to build a better South Africa. We have taken on the challenge that the legacy of apartheid left us – a legacy of disempowerment, landlessness, inequality of opportunity, and millions of unemployed young people who cannot see a realistic prospect for a decent life. Confronting these realities is not about blaming the past or denying our own shortcomings. It is about recognising that now is the time to do extraordinary things, in dealing with our particular development circumstances. It requires new ideas and bold efforts from all: government, business, labour, communities and every family. We must show, across the economy, the game-changing strengths we have shown on big issues, from creating our democracy to hosting Africa’s first Soccer World Cup festival. Now we have to ignite the flame of higher inclusive growth, and sustain it. We cannot view the fact that 42% of young people between the ages of 18 and 29 are unemployed as merely a statistic. Young men and women in cities, informal settlements, towns and villages may not have jobs, but have skills in life. They possess the awareness and the ability to learn, they drive fashion and inspire with their music, yet they know their local traditions. And they have hope, and look to us to give meaning to that hope. In response we must take measures to ensure that our young people can look forward to decent work in productive, competitive enterprises. It means that we will continue to strengthen social expenditure, enabling families to commit to participating in education and community activities, while supporting the old and sick. Inclusive growth means strenuous efforts to cut back poverty and shrink the inequality that continue to blight us. The South African growth path we envision is not measurable by GDP alone. It must be an inclusive growth, which especially benefits the many South Africans who have been left behind. Inclusive growth also means addressing the climate change challenges that confront the long-term global outlook. This year South Africa will host the 17th UN Conference of the Parties on climate change. Our own efforts to green our economy will come under special scrutiny. Mitigation initiatives are not just about reducing the dangers associated with a hotter future, but they also offer significant opportunities to create jobs and reduce costs in our economy. And so in mapping a new growth path that will lead to rapid creation of jobs, that will ensure an equitable distribution of benefits, that will reduce inequality, ignite industrial development and transform rural and urban communities – in charting this course, we are mindful of the specific realities of our circumstances and the changing shape of the global economy. As comrade Chris Hani so rightly said, “We want to build a nation free from hunger, disease and poverty, free from ignorance, homelessness and humiliation, a country in which there is peace, security and jobs.” It is time to celebrate and embrace the potential of our unemployed young, knowing that they are our future. How we meet this challenge will shape the quality of life that our children and their children will enjoy. Mister Speaker, there are encouraging signs of stronger recovery in the global economy as we enter 2011. But it remains essentially a two-speed recovery. There is moderate growth in the United States and parts of Europe again, whereas China and many other emerging economies continue to expand rapidly. The roots of this divergent growth pattern lie in the unbalanced structure of world growth in the years leading up to the financial crisis. World growth came to rely too heavily on countries that exhibited overly high consumption, financed by countries with high savings and large trade surpluses. The financial crisis and subsequent recession brought painful adjustments. However, the shift in world trade, investment, manufacturing, incomes and consumption is a structural transition that will take many years, as a multi-polar world evolves. Up until the turn of the century, developing countries accounted for about 20% of global output. This will increase to 40% by about 2015. Developing economies in Africa, Latin America and South Asia will play an increasingly important role in the global economy in coming years as incomes rise and poverty falls. South Africa’s invitation to join the BRIC (Brazil, Russia, India and China) economies reflects this broadening of the sources of economic growth. Over the next five years, these economies will account for 36% of world economic growth. We have to construct our own growth and development strategies to propel our economy forward, create jobs and compete on the global stage. Supporting rural development and regional integration. The latest estimate released by the Statistician-General is that the domestic economy grew by 2.8% in 2010. Strong commodity prices, low interest rates, and faster global growth, have been the main forces behind our economic recovery. Improving household consumption and accelerating investment will support an increase in economic growth over the medium term. Real GDP growth is projected to reach 3.4% in 2011, 4.1% in 2012 and 4.4% in 2013. Steady employment gains – of about 2% a year – will raise disposable incomes, supporting household consumption and investment. Private gross fixed-capital formation increased in the second and third quarters of 2010 – a marked turnaround after five successive quarters of decline. Total investment is expected to grow by 3.9% in 2011, rising to 6.8% in 2013. The buoyancy of the investment recovery is an important determinant of future economic growth. Real growth in exports is expected to average 6.5% a year over the medium term as commodity exports benefit from strong demand and high prices. Inflation is forecast to remain within the target range of 3 – 6%, edging towards the upper end of the range in 2013 as the economy strengthens. Increasing food and oil prices represent risks to the inflation outlook. The price of Brent crude reached US$107 yesterday – further increases will put upward pressure on prices more broadly. The improved terms of trade for South Africa contributed to a better current account deficit for 2010 than was expected a year ago. As it widens from the 3.2% of GDP expected this year to 5% in 2013, we would like it to reflect rapidly rising investment rather than higher consumption. Mister Speaker, the growth and transformation of financial markets in recent decades has seen increased volatility of exchange rates and capital flows. Global commodity markets now account for significant fluctuations in prices for our energy imports, mineral exports, and food supplies. The macroeconomic environment facing South Africans – through interest rates, exchange rates, inflation, and credit conditions – can be destabilised by those international shocks. The macroeconomic policy task is to provide a stable and predictable economic environment by offsetting such shocks as far as possible. Our monetary policy, designed to target inflation, has been conducted successfully by the South African Reserve Bank, achieving the current low rate of inflation and interest rates. Fiscal and monetary policy will continue to work in partnership. Monetary policy, operated by the Reserve Bank, will continue to be focused on controlling inflation, and we will continue to ensure that fiscal policy is countercyclical within a sustainable long-term framework. Movements in the exchange rate affect different sectors of the economy in different ways, and present difficulties in macroeconomic policy for many countries. Recognising the impact of rand strength on the manufacturing industry, in particular, we announced measures in October to moderate the potential effect of capital inflows. Foreign exchange regulations were amended to permit greater foreign investment by South African institutions. Stepped up foreign exchange purchases by the Reserve Bank have partially offset upward pressures on the rand. As a result of these policy adjustments, and in line with shifts in investor sentiment globally, the rand depreciated from December 2010 to mid-February 2011 by about 10% against the US dollar, the euro and sterling. During 2010 South Africa received net inflows of R92-billion in liquid foreign capital, which contributed to upward pressure on the exchange rate. Since the fourth quarter of last year, South Africa experienced capital outflows. Along with uncertainties and volatility in global financial markets this contributed to the depreciation of the rand. Furthermore the increase in oil and food prices is posing new risks to the inflation outlook. Government will continue to assist the Reserve Bank to accumulate foreign exchange reserves when market conditions are favourable and engage in foreign currency swaps to moderate the effect of capital flows on the exchange rate. Overly rapid currency depreciation carries risks to macroeconomic stability, however, and so we expect the Governor of the Reserve Bank to be vigilant in monitoring inflationary pressures and ensuring that monetary policy is effective in meeting our inflation targets. The credibility of monetary policy in achieving our target inflation range, combined with our commitment to fiscal discipline, are important foundations for moderating exchange rate volatility. Changes in the volume and direction of capital flows may be significant over the year ahead, and are largely beyond our control or influence. We will allow the actions announced in the MTBPS to have their full effect and continue to monitor capital flows. Other countries, too, experienced high capital inflows in 2010. Several, including Brazil, South Korea, and Thailand, introduced tax or regulatory measures to deter such investment flows and currency speculation. We have examined these options and their impact, and will continue to monitor the adjustments made in other countries, while recognising that circumstances vary from country to country. National Treasury is cognisant of the risk that financial instability and currency volatility can arise from large capital movements. If necessary, appropriate steps to moderate these effects will be taken, together with the Reserve Bank. Mister President, you pointed out in your State of the Nation address that our financial sector proved to be remarkably resilient in the face of the recent financial crisis and the global economic meltdown. In line with global developments, there are further steps to be taken to enhance the regulatory framework and improve financial services. The proposed reforms include a shift to a “twin peak” system of financial regulation, with market conduct under the Financial Services Board, and prudential regulation in the Reserve Bank. An inter-agency financial stability oversight committee will be formed, and a Council of Financial Regulators. A policy discussion paper sets out the new framework for how the financial sector could better serve South Africa. Among the issues to be addressed are the findings of Judge Jali’s Enquiry into Competition in Banking – findings that are echoed by many people’scomplaints that bank charges are high and opaque. I have met with the chief executives of our banks to take up this issue, and I believe it is time to put in place measures that will ensure that banking charges are fairly set, are transparent and do not create undue hardship. As part of the work of modernising and harmonising our investment framework, Treasury is releasing two further discussion papers – one on the regulation of foreign direct investment, and another on the prudential framework for institutional investors. We look forward to consultation with stakeholders on these issues over the coming months. South Africa adopted a countercyclical fiscal stance two years ahead of the crisis. We entered the recent recession with a healthy fiscal position and a comparatively low level of debt. This allowed us to maintain government spending despite a sharp deterioration in revenue. Government spending continues to grow over the next three years, though at a slower rate than in the recent past. Since the Medium Term budget Policy Statement, several additional spending allocations have been made, including provision for a response to the damage caused by last year’s floods. The impact of slightly slower growth in revenue and the additional expenditures is that the deficit for next year is half a percentage point of GDP higher than we projected in October. The trend remains downwards however, with a deficit of 3.8% of GDP expected in 2013/14. This reduction in the deficit over the next three years is consistent with stabilising the growth in our debt and the conduct of a countercyclical fiscal policy. National government net debt is set to rise from R526-billion at the end of 2008/09 to over R1.3-trillion in 2013/14. Mister Speaker, to ensure that our spending on schools, hospitals and roads is not crowded out by an ever-rising interest burden, government debt needs to be managed sustainably. We don’t want an unmanageable increase in expenditure, nor do we want the severe austerity measures some western countries have had to adopt. Inter-generational equity, so that our children’s wellbeing is not compromised by short-term interests. Developing fiscal and budgetary guidelines will strengthen parliamentary oversight, encourage transparency and enhance accountability. Mister Speaker, our Constitution sets out specific criteria for the sharing of nationally-raised revenue between national departments, provinces and municipalities. Proposals for this division are set out in the Division of Revenue Bill. Total expenditure from the National Revenue Fund of R889-billion is provided for in 2011/12, which is 9.8% more than the revised estimate for 2010/11. Debt service costs will amount to R77-billion next year, rising to R104-billion in 2013/14. Though our overall debt burden remains moderate, the size of the budget deficit at present results in debt service costs rising faster than any other category of spending over the period ahead. In keeping with established practice, the budget framework includes an unallocated contingency reserve of R4-billion in 2011/12, R11-billion in 2012/13 and R23-billion in 2013/14. This allows for unforeseeable and unavoidable spending requirements next year, and future policy priorities over the medium term. This leaves R808-billion to be allocated between national, provincial and local government in 2011/12, up from R743-billion in 2010/11 and rising to R926-billion by the end of the MTEF period. National departments are allocated 47% of the total, provinces 44% and municipalities just under 9%. National transfers to local government have increased substantially, and will amount to over R70-billion in budgetary assistance and infrastructure grants in the 2011/12 year. Mister Speaker, the proposed medium-term expenditure framework has been structured to enable government’s policy priorities to be implemented, in accordance with delivery agreements. The 2011 budget makes available R94-billion in addition to baseline allocations over the next three years. Savings of R30.6-billion were identified, of which R21.6-billion was reprioritised within departmental baselines to meet existing commitments. In order to accommodate additional funding for the National Student Finance Aid Scheme, all departments were required to effect unprecedented spending cuts of 0.3%, amounting to R6-billion. I want to place on record our appreciation to Cabinet colleagues and departmental accounting officers for their co-operation. Part of this revision to baseline allocations is the carry-through cost of the 2010 wage agreement, which requires an additional R39.4-billion for remuneration of employees over the MTEF period. The public service salary bill has doubled over the past five years, from R156-billion to R314-billion. This constitutes just under 40% of consolidated non-interest expenditure. Members of the House will know that the spending plans of national government departments, public entities and social security funds are set out in considerable detail in the Estimates of National Expenditure. Estimates of consolidated government expenditure for the period ahead are set out in chapter 8 of the budget Review. Consolidated expenditure is projected to increase from R897-billion in 2010/11 to R1.2-trillion in 2013/14, with non-interest spending on public services growing by an average of 8% a year. As you have emphasised, Mister President, our aim is to put development first, and not dependence on welfare. As announced by the president, R9-billion has been set aside over the next three years for a Jobs Fund to co-finance innovative public- and private-sector employment projects. Further education and training colleges are allocated over R14-billion for the period ahead, and student financial assistance will be stepped up. Over R20-billion goes to Sector Education and Training Authorities and R5-billion to the National Skills Fund, which have key responsibilities for training work-seekers. The expanded public works programme is R73-billion over the next three years, including community-based projects, environmental and social programmes and maintenance of roads and infrastructure. Tax incentives have been renewed for manufacturing investment of R20-billion, with a focus on job-creation potential. Investment will be increased in housing, and residential infrastructure and services. Small enterprise development initiatives will be strengthened, including a focus on employment activation by the National Youth Development Agency. Initiatives are under way to promote rural employment, and provide stepped up support for agricultural producers. Funding is allocated for renewable energy, environmental protection and “green” economy initiatives. As promised last year, details of a R5-billion youth employment subsidy are set out in a discussion paper, for further consideration in the House and at Nedlac. We must offer young work-seekers real hope where at present there is despair. We need to do things differently. We need to have the courage to pilot new approaches and build new partnerships, promoting innovation throughout our economy. Education takes up the largest share of government spending – 21% of non-interest allocations – and receives the largest share of the additional allocations. An amount of R8.3-billion over the MTEF period is added for schools infrastructure. A programme to address backlogs in school facilities over a three-year period will be administered by Minister Motshekga’s department. Just under R1-billion is added for funza lushaka teacher bursaries and bursaries for postgraduate students in natural sciences. R9.5-billion is provided for expanding further education and training colleges and skills development. Including adjustments for the remuneration of teachers, a total of R24.3-billion will be added to education and skills spending over the next three years, which rises from R190-billion next year to R215-billion in 2013/14. Minister Nzimande and Minister Motshekga exercise stewardship, Mister Speaker, over the largest network of service providers in our economy, and the most important programme of investment in future growth and redistribution. Several further steps in implementing Minister Motsoaledi’s ten-point plan for reform of health services are accommodated in this budget. Total spending on public health services has increased strongly over the past three years, from R63-billion in 2007/08 to R113-billion projected for next year. Expanding capacity to train medical doctors and nurses. Total expenditure on the Comprehensive HIV/Aids conditional grant will amount to R26.9 billion over the MTEF period, based on an increase in the number of people on treatment from 1.2-million this year to 2.6-million by 2013/14. The phasing in of National Health Insurance will require substantial reforms to address imbalances across the public and private sectors and expand health professional training. The financial and organisational implications of these reforms are being jointly addressed by the Department of Health and the Treasury. Additional resources are also allocated to the safety and security cluster led by Ministers Radebe, Mthethwa, Cwele and Mapisa-Nqakula for the period ahead. A total of R12.8-billion goes to the departments of Police, Justice and Constitutional Development, Correctional Services and the Independent Complaints Directorate. The budget provides R2.1-billion for the increase in police personnel to 202 260 in 2013/14, from about 190 000 at present. An additional R670-million is allocated for the upgrade of information technology over the MTEF period, and R490-million is for construction of courts, including new high courts in Nelspruit and Polokwane. Total expenditure on public order and safety functions will amount to R91-billion next year, rising to R105-billion in 2013/14. On Minister Sisulu’s Defence vote, further allocations are made for assistance in safeguarding the country’s borders, and to upgrade and maintain border facilities and equipment. Additional funding of R1.3-billion in 2011/12, rising to R2-billion in 2013/14, will bring total expenditure on defence and state security to R38.4-billion next year, rising to R43.9-billion in the outer year. R55-million for Khula Enterprises to pilot a new approach to small business lending. Under the guidance of Minister Davies, about R10-billion will be spent on Industrial Policy Action Plan investment promotion over the MTEF period, including the automotive production and development programme, clothing and textiles production incentives, the film and television production incentive and support for small manufacturing and tourism enterprises. Small businesses are an important source of jobs. Businesses that employ fewer than 50 workers account for 68% of private sector employment. We need to get our small business sector growing. Allow me to share just a few inspiring examples. Mlondolozi Kosi is a young man with a passion for building skills in his community, Willowvale. He has set up a small ICT training Centre where he has trained more than 120 people IT skills. Norman Mpedi is an ex-MK combatant, who after being forced to live off the bush in Angola discovered the umviyo fruit and has grown this into a thriving juice-making, Nguni Juice. Antonio Pooe started Exactech Fraud Solutions in 2007 as a small one-man business operating out of his home and has since grown it to a company with offices in Johannesburg, Cape Town and Durban and he now employs 24 people. These are a few examples of thousands of small and micro businesses which have taken root and fill a vital place in our economy. In many instances they have been supported by financing from both the private sector and programme of the Department of Trade and Industry. Under Minister Joemat-Petterssen and Minister Nkwinti, government’s land reform and agricultural development programmes are focused on rural job creation and poverty reduction, while expanding agricultural production and improving food security. Additional allocations amounting to R2.2-billion go to these functions, including a further R400-million for the comprehensive agricultural support programme and the land care programme grant and funding to enable a further 5 000 recruits into the National Rural Youth Services corps. Including provincial allocations for agricultural support, a total of R19-billion will be spent on rural development and agriculture in 2011/12, rising to R21-billion in 2013/14. Additional allocations of R10.3-billion are made over the MTEF for transport infrastructure and services on Minister Ndebele’s vote. This includes R3.8-billion for maintenance of the coal haulage road network, financed from the increased levy on electricity collected from Eskom. An additional R1.5-billion goes to provinces for road maintenance and weighbridges, as part of a new conditional grant for roads infrastructure. Funds are also stepped up for the Passenger Rail Agency of South Africa, for replacing signaling infrastructure and refurbishing rail coaches. A further R2.5-billion goes to municipalities for public transport systems and infrastructure. Consolidated government transport spending will amount to R66-billion next year, rising to R80-billion by 2013/14. Funding amounting to R800-million has been set aside over the next three years for “green economy” initiatives. Specific allocations will be made in the Adjustments budget. Additional allocations for research into energy-efficiency technologies are proposed, efforts to prevent wildlife trafficking and improved air quality, waste disposal and coastline management. A total of R2.2-billion is allocated for environmental employment programmes over the medium term period and funding is provided on Minister Molewa’s vote for hosting the Conference on Climate Change in November this year. Total spending on the integrated national electrification programme will increase to R3.2-billion in 2013/14. Mister Speaker, recent research published by the Development Policy Research Unit confirms that significant progress has been made in the delivery of housing, water, sanitation and electricity. With flush or chemical sanitation, from 18% to 37%. Additional allocations to Minister Sexwale’s vote for human settlements upgrading and municipal services amount to R4.9-billion over the MTEF period. Two new grants to provinces and municipalities are proposed under Minister Shiceka’s oversight, to respond more rapidly to disasters. A further R3.6-billion is added for water infrastructure and services, including funding for the acid water drainage threat associated with abandoned underground mines. A report on this by a team of experts has been approved by Cabinet, and Minister Molewa is taking the lead in consulting with industry on a shared and coordinated response. Government aims to upgrade 400 000 homes in informal settlements by 2014. A new urban settlements development grant contributes R21.8-billion over the next three years for these projects. Total spending on the housing, water and community amenities social wage will amount to R122-billion in 2011/12, rising to R138-billion in 2013/14. This practical expression of a caring society amounts to R147-billion in 2011/12, rising to R172-billion in 2013/14. Income support to poor households has been extended over the past decade, mainly through the phased extension of the child support grant to older children. At present close to 15-million fellow citizens receive social grants on Minister Dlamini’s vote, equivalent to more than a quarter of the population. Social grant payments mainly go to pensioners (38%), children in poor households (35%) and the disabled (19%). The child support grant will increase from R250 to R260 in April, and to R270 in October. Revisions are also proposed to the means test thresholds, which will benefit households with modest incomes that reduce their grant entitlements. Social protection also includes unemployment insurance, occupational injury compensation and the road accident fund. Proposals are now well advanced for alignment and consolidation of these social security arrangements, together with the introduction of a mandatory basic retirement savings plan. Over R9-billion a year is currently spent in administering our fragmented social security system. An integrated and better coordinated social security system will offer better protection to vulnerable households, at a lower administrative cost. Let me turn, Mister Speaker, to the revenue required for these spending plans. Members of the House have been very patient, and may be thinking of the need for liquid refreshment, and the cost thereof! I will say something about that in a moment. But first let me report on revenue. I am pleased to report that tax revenue has recovered during 2010/11. The revised estimate is R672-billion, or 12.3% higher than last year. Personal income tax has increased strongly as have VAT receipts and customs duties. However, corporate income tax revenue has remained below projections, indicating the effect of the 2009 recession on company profits. Total budget revenue, including provincial receipts, and income of social security funds and public entities, is R755-billion, or 13.6% above the 2009/10 estimate. This budget Review includes, for the first time, a tax expenditure statement. This is a summary of potential tax revenues foregone as a result of various tax incentives. The purpose of the statement is to make transparent those fiscal incentives or indirect subsidies that lie behind the headline revenue and spending numbers. The initial estimate puts the value of tax expenditures at R78-billion a year. We are also publishing the latest edition of the annual Tax Statistics which provides the most detailed view to date of our tax base and revenue contributions and helps to complete the overall picture of the budget system. Mister Speaker, revisions to the personal income tax brackets and rebates are proposed which represent relief for individuals of R8.1-billion. These adjustments compensate for the effects of inflation for the coming year and the balance of the fiscal drag effect that could not be accommodated last year. Tax will be payable only on income above R59 750 for taxpayers below age 65, and R93 150 for those 65 and older. A third rebate of R2 000 per year is proposed, increasing the tax threshold for taxpayers aged 75 and older to R104 261. An increase in the annual tax-free interest income to R22 800 for individuals below 65 years is proposed, and to R33 000 for individuals 65 years and over. The treasury is exploring the possibility of incentivised savings schemes for housing or for education as alternatives to this exemption. The tax-free lump sum benefit upon retirement will increase from R300 000 to R315 000. As in past years, inflation-related increases will be made to the monthly thresholds for tax-deductible contributions to medical schemes. These deductions and those for qualifying out-of-pocket medical expenses will be converted into tax credits with effect from March 2012. A tax credit is more equitable since it provides for an equal benefit to all taxpayers regardless of their income. Changes to the tax treatment and administration of contributions to retirement funds are also proposed. These will simplify administration and improve the fairness of the system. There will be extensive consultation on the matter. The proposals include treatment of employer contributions as a fringe benefit, limits on tax deductible contributions and alignment of the tax treatment of provident and pension funds. From March 2012, an employer’s contribution will be treated as a taxable fringe benefit, and employees will be allowed to deduct up to 22.5% of taxable income for contributions to approved retirement funds. A maximum of R200 000 a year will be deductible. With a view to protecting workers’ savings, it is proposed that the one-third lump-sum withdrawal limit applicable to pension and retirement annuity funds should also apply to provident funds. On disposal of a small business when a person is 55 years or older, from R750 000 to R900 000. The annual trading income exemption for public benefit organisations will increase from R150 000 to R200 000, and for recreational clubs from R100 000 to R120 000. Mister Speaker, last year we indicated that the taxation of gambling winnings would come under review. With effect from April 2012, all winnings above R25 000, including pay-outs from the National Lottery, will be subject to a final 15% withholding tax. This is in line with practice in a number of other countries, such as the United States. I hope it will assist in discouraging excessive gambling. Despite the obvious merits of this argument, I expect vigorous debate during the Parliamentary process. Proposals are under review for a national health insurance system, as part of the broader restructuring and enhancement of health services. There will be substantial cost implications. We will consider and consult on options for meeting the funding requirements, including a payroll tax (payable by employers), an increase in the VAT rate and a surcharge on individuals’ taxable income. The fiscal and financial implications of health system reform, and alternative revenue sources, will be examined in the year ahead. As indicated in previous years, a dividends tax will take effect on 1 April 2012, replacing the secondary tax on companies. Dividend schemes that undermine the tax base will be closed by treating the dividends at issue as ordinary revenue. These include dividend cessions, where taxpayers effectively purchase tax-free dividends without any stake in the underlying shares. Government introduced the concept of a venture capital company into the Income Tax Act in 2009, but the response has been poor. The approach will be refined so as to facilitate greater access to equity finance by small and medium businesses and junior mining companies. From March 2011, the turnover tax for micro businesses with annual turnover up to R1-million will be adjusted so that tax will be payable only if turnover exceeds R150 000 a year. The rate structure will also be reviewed. Also, from 1 March 2012, micro businesses that register for VAT will no longer be barred from registering for turnover tax. The learnership tax incentive, designed to support youth employment, will expire in September 2011. Government proposes to extend this for a further five years, subject to an analysis of its effectiveness with all stakeholders. A youth employment subsidy is proposed. Subject to completion of consultations, it will take the form of a tax credit costing R5-billion over three years to be administered by the South African Revenue Service through the PAYE system. To support the objectives of the industrial policy action plan and the New Growth Path, certain investments qualify for tax relief. Consideration will be given to expanding such incentives for labour-intensive projects in Industrial Development Zones (IDZs). The transfer duty exemption threshold will be increased from R500 000 to R600 000. Excise duties on alcoholic beverages will be increased by between 4.5 and 10.3% – an increase of 6.4 cents for a 340ml can of beer, 13.5 cents per bottle of wine, or R2.86 for a bottle of spirits. Taxes on tobacco products will increase between 6 and 10.2% – 80 cents more for a packet of 20 cigarettes. Currently there is an ad valorem excise tax on new motor vehicles. The rate increases as the price of the vehicle increases. These rates will remain unchanged below a purchase price of R900 000. For vehicles above R900 000, the tax rate will increase to a maximum of 25%, from 20% at present. The general fuel levy will increase by 10 cents a litre on both petrol and diesel on 6 April 2011. The Road Accident Fund levy will be increased by 8 cents to 80 cents a litre. Increases will take effect on 1 October 2011 in the air passenger departure tax on flights to international destinations. The levy on electricity generated from non-renewable and nuclear energy sources will increase by 0.5c/kWh to 2.5c/kWh from April 2011. The increase should not impact on electricity tariffs, as it has already been taken into account in the National Energy Regulator’s approved tariff structure. Mister Speaker, allow me to pay tribute again to the continued support received from millions of honest taxpayers. Their contributions are reflected in the recovery of tax revenue this year. We have been able to expand spending where other nations have been forced into austerity adjustments. Even those who have not contributed fully to date have begun to come forward to take advantage of the Reserve Bank and SARS’s voluntary disclosure programmes. Others who wish to have until the end of October this year to join the 1 200 applicants to date. Administrative reforms will continue to focus on ensuring that all those who earn an income through employment or other economic activity pay what is due to the fiscus. This year, SARS will turn its attention to enhancements to the business tax process including corporate income tax, VAT and an enhanced Turnover Tax for emerging businesses. As with personal income tax, a pre-requisite for these improvements is an accurate picture of all business entities no matter their size or tax liability. SARS, in partnership with other state institutions, will make significant improvements to the business registration process this year – including conducting a door-to-door drive in the informal sector to help complete the picture. Tax and customs evasion remains a serious threat. Working together, the police, the prosecuting authority, the Financial Intelligence Centre and SARS ensured that more than 200 taxpayers were convicted of fraud and tax evasion during the last six months. Recently, customs officers with the support of the police impounded nearly 3 000 illegally imported second-hand vehicles, two significant tobacco-smuggling rings have been snuffed out and a tobacco manufacturer has been shut down in the last month. We are also, in conjunction with the tobacco industry, investigating a new method of marking and authenticating legal cigarettes with a counterfeit-proof digital system to replace the current “diamond mark”. Mister Speaker, the sector most visibly affected by the illicit economy in recent years has been the clothing and textile industry, resulting in significant loss of jobs in local manufacturing plants. In the coming months a multidisciplinary task team comprising representatives of the manufacturing, importing and retail industries and a range of public sector stakeholders, will begin interventions across the entire supply chain to clamp down on illicit clothing and textiles imports. Mister Speaker, public procurement plays a significant part in the economy and is central to government service delivery. However, citizens and taxpayers do not get full value for money, because this is an area vulnerable to waste and corruption. This compromises the integrity of governance and frustrates the pace of service delivery. Alongside the work of the competition authorities in addressing supplier collusion and tender-rigging, a strong procurement framework is critical to boosting jobs and service delivery. Government departments will be required to establish rigorous demand management procedures, including submission of advance tender programmes for the next financial year to the relevant treasury authority. Limits will be prescribed for variation orders, to restrict significant changes to procurement orders and bring our system in line with international standards. Companies bidding for tenders will be required to disclose the identity of all directors, to determine whether any of the directors are government officials or tax non-compliant. There are currently 53 investigations involving procurement irregularities, involving contracts worth R3-billion. Minister Radebe recently reported that 65 people linked to some of these investigations have been arrested and brought before the courts. More than R250-million has been seized by the state. SARS is investigating another 9 cases of tender fraud, with a total value of approximately R1.7-billion. SARS has also increased its analytical capacity with the aim of ensuring that vendors winning state contracts satisfy their tax obligations fully. As at the end January 2011, SARS had identified some 13 000 vendors who have won state contracts and who owe taxes amounting to over R1-billion. Mister Speaker, we have a shared responsibility to prevent corruption and we call on all citizens to blow the whistle on corruption and to report any procurement irregularities to the relevant authorities. Equally important is the call of this Government to its managers to ensure that our communities and our taxpayers get full value for their money. Poor delivery and stealing from the fiscus are never acceptable. Senior managers of our institutions and municipalities are expected to work actively to improve their procurement processes and oversight. Mister Speaker, government and state-owned enterprises will spend more than R800-billion over the next 3 years on new power stations, road networks, dams and water supply pipelines, rail and ports facilities, schools, hospitals and government buildings. This builds on the steady progress made over the past decade which saw the contribution of government and public enterprises to gross fixed capital formation rise from 4% of GDP in 2000 to 8.6% in 2009. These are long-term investments in the future of our country, and in the capacity of the economy to grow and create jobs for generations to come. And the R21-billion freeway improvement scheme, which has already significantly eased congestion on Gauteng roads. These investments are largely financed through borrowing, with costs recovered from future electricity consumers and road-users. As part of a long-term strategy for modernising public transport in metropolitan areas, the Passenger Rail Agency of South Africa is embarking on an 18-year programme to replace its coach and locomotive fleet, at an estimated cost of R86-billion. While infrastructure spending in the lead-up to the Soccer World Cup assisted in moderating the impact of the recession on South Africa, there has been an apparent deterioration in government construction spending over the past year. The challenge of intensifying infrastructure spending over the period ahead will require attention to planning, budgeting and contract management in national and provincial departments and municipalities. It is time for special initiatives to accelerate growth and development in South Africa’s cities, which have immense potential for inclusive growth and are home to many millions of poor people. The public finance challenge is to balance investment in expanding urban capacity while also providing key public services – electricity, water, sanitation, refuse removal and public transport. An efficient and cost-effective public transport system is crucial because the majority of our people live too far from where job opportunities are. In addition, through better land use management, we need to deliver integrated human settlements that break from the apartheid past. A start is made in this budget, in the allocation of funds directly to cities to upgrade informal settlements. Minister Sexwale will implement the accreditation of municipalities which have demonstrated their capacity to manage the low-income housing subsidy system. The public transport function, including the management of rail, has been delegated by Minister Ndebele to metropolitan municipalities in terms of the National Land Transport Act. These are steps that create direct responsibilities for city councils, and open up opportunities for accelerating investment and change in the urban landscape and how cities promote their local economic development. Mister Speaker, a Development Finance Institutions Council has been established, as recommended by a review committee. One of its primary tasks is to ensure alignment between the programmes of these institutions and government’s development agenda. Members will recall that in last year’s budget we agreed to support an expanded lending capacity of several development finance institutions. The recapitalisation of the Land Bank is under way. So far, R1.7-billion has been transferred to the Land Bank, and its finances are improving. The Land Bank board has agreed to step up the Bank’s support for emerging farmers. In cooperation with the Departments of Rural Development and Land Reform, and Agriculture, Forestry and Fisheries, steps are in progress to turn failing farms that were transferred to emerging farmers under the land reform programme into successful business enterprises. The lending capacity of the Development Bank of Southern Africa has also been enhanced, by providing an interim guarantee while processing the necessary legislative amendment. The DBSA is now working closely with National Treasury and the departments of Health and Water Affairs, amongst others, on strengthening infrastructure project management – revitalising five major hospitals and their medical faculties, and preliminary planning of nine bulk water schemes. The Bank also plays a key role in supporting municipal financial capacity, and will assist in operationalising the new Jobs Fund. Our agreement is that the delivery capacity and excellence we mobilised at national level to build stadiums and host the World Cup, will be the benchmark for undertaking these initiatives. Including the investment and lending capability of the Industrial Development Corporation, our development finance institutions are ready to expand financing substantially over the next three years. The challenge is to ensure available funds are allocated effectively and efficiently, to contribute to raising productive capacity and to complement the investment activities of the wider financial sector. Mister Speaker, I extend my sincere appreciation to the president and deputy president for their unwavering support and wise counsel. Keeping our country on a steady course through the Great Recession has been a challenging task for all of us and the support of the Presidency has been both indispensable and inspirational. I would like to thank my Cabinet colleagues for their support. The budget is our collective statement. Your positive and encouraging contributions have been most helpful. The Members of the Ministers Committee on the budget have shouldered an immense responsibility to restructure and reform our fiscal system and make bold recommendations to Cabinet. Theirs has been an excellent and enduring team effort. Deputy Minister Nene has offered wise insights and shared many responsibilities. He forms an invaluable part of a maturing ministry. Thanks also go to the MECs for Finance, who play a vital role in managing over 40% of the budget. Staff of the Ministry who make my work easier and give vital support daily. I thank my family for their support and sacrifices so that I may serve our country. Once again my sincere appreciation to the wide range of South Africans who provide positive feedback and ideas on how government could work better and differently. Fellow South Africans, the president has clearly stated that job creation is our number one priority. This budget outlines what government’s capabilities and finances can do to support the delivery of jobs. Giving every South African the dignity of a job, the security of an income, the prospect of training, the support to launch new businesses, the confidence to be an entrepreneur and the sheer passion and optimism to break the shackles of unemployment – is the best legacy this generation can leave for the next. The world is full of opportunities. Ours is the task of transforming these opportunities into real, tangible outcomes which all of our people can experience and call their own. We repeat, with jobs comes dignity. With dignity comes participation. And from participation emerges prosperity for all.